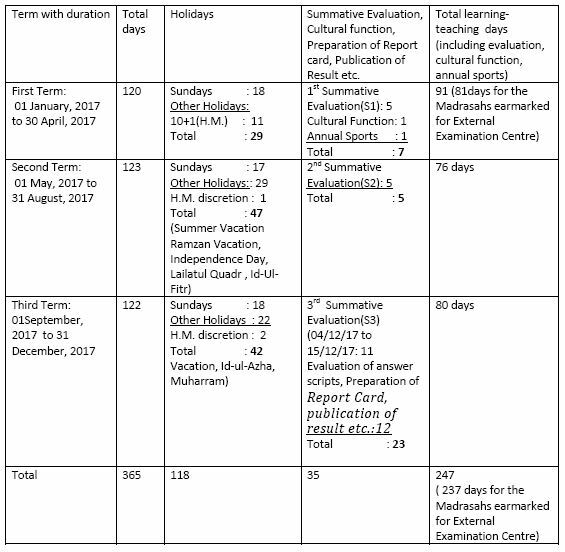 I am directed to inform you that the annual academic calendar for the academic session-2017 has been prepared for smooth functioning of day to day academic activities of Madrasahs. You are requested to implement this Annual Academic Calendar for the Academic Session 2017. Your cooperation for effective implementation of this calendar will be highly appreciated. Monday to Friday : 10.35 a.m. to 4.30 p.m.
Saturday: 10.35 a.m. to 2.00 p.m.
Daily Assembly shall start at 10 (ten) minutes before class teaching (10.50 a.m.) i.e. at 10.40 a.m. Attendance in daily assembly shall be compulsory for all teaching and non-teaching staff including the Head of the Madrasah/TIC. Head of the Madrasah and all teaching & non-teaching staff of the Madrasah shall attend the Madrasah within the appointed hour (10.35 a.m.) and not leave before the Madrasah closes for the day. The appointed hour of the Madrasah shall be 15 (fifteen) minutes before the commencement of the class teaching(10.50 a.m.) i.e. at 10.35 a.m.
Late attendance shall be counted for all teaching & non-teaching staff of the Madrasah from the start of class teaching (10.50 a.m.) up to twenty five minutes from appointed hour i.e. up to 11.00 a.m. & no teaching and non-teaching staff including Head of the Madrasah/TIC will be allowed to record his/her attendance after 11.00 a.m. However, in very special circumstances, Head of the Madrasah/TIC ( In case of teacher & nonteaching staff ) or Secretary/Administrator ( in case of Head of the Madrasah/TIC) may condone such late attendance of the staff, if the said authority is satisfied with the explanation offered by the employee. One day’s casual leave will be deducted for every three days late attendance in a calendar month. In case the casual leave account of the staff is exhausted and the incumbent concerned comes late, he/she shall be asked to apply for one day’s “Half average pay” leave for each three day’s late attendance in a calendar month. If he/she fails or declines to apply for such leave or if there is no such leave in his/her credit then he/she will be granted “Leave without pay” leave for each three day’s late attendance in a calendar month. 40 minutes shall be earmarked for Tiffin or Recess from Monday to Thursday. 60 minutes shall be allotted for Recess/ Zum’a for Friday. (7) All academic works/ activities including seminar, workshop, meeting etc. conducted by the Board and other duties relating to the improvement of Madrasah Education should be treated as urgent and fall within the bounden duties and functions of a Teacher/ Head of the Madrasah/TIC serving in a Madrasah. All Teachers must attend classes allotted to them regularly and they must come to their classes in time. No teacher shall refuse the class of an absent colleague if allotted by Head of the Madrasah/TIC. The Head of the Madrasah shall attend at least 10 classes per week. All teaching and non-teaching staff including Head of the Madrasah are required to participate in all cultural functions, Annual Sports and all co-scholastic activities. The Madrasah shall arrange for holding parent-teacher meet at least twice in a year. All Madrasah Authorities are encouraged to form Mother-Teacher Association to stop drop-out and to enhance quality of Education. One Period per week is to be used for project-based learning from classes V to VIII. Madrasah Authorities make necessary provisions for classroom transactions regarding optional elective subjects, wherever required, out of allotted periods. First language also includes Grammar and Rapid Reader wherever applicable. 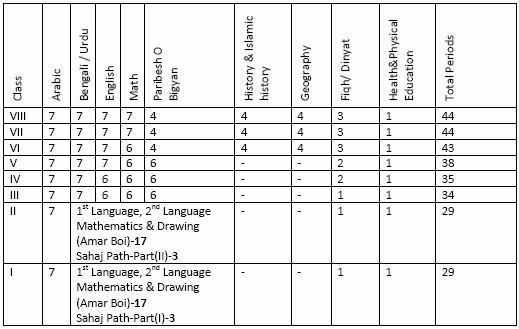 For class IX & X, the classes for Internal Formative Assessment to be arranged within the allotted number of periods.